YOUR RESALE BUSINESS AD LISTING HERE. Do you own a Resale Business? Are you the owner of a consignment shop? Do you help with the marketing for a Thrift store? Do you deal in used books or antiques? How about used furniture resales? Are you looking for Resale Business Marketing? 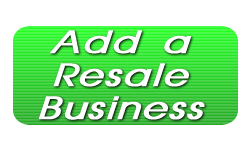 Add your Resale Business to The Resale Guide directory today!